Review and expand your understanding of Spanish Past Tenses. Having learned the basics... now expand your understanding of the differences and similarities between the Preterite, the Imperfect and the Past Progressive. Tell what wou and your family did this last Summer or last week-end. 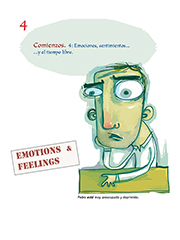 Learn to describe and talk about your current and past feelings and emotions. Learn to describe what you do (or used to do) to deal with those emotions and feelings. Take a challenge: Add a new past tense to the mix: the Past Perfect. Enjoy reading very short stories in Spanish.